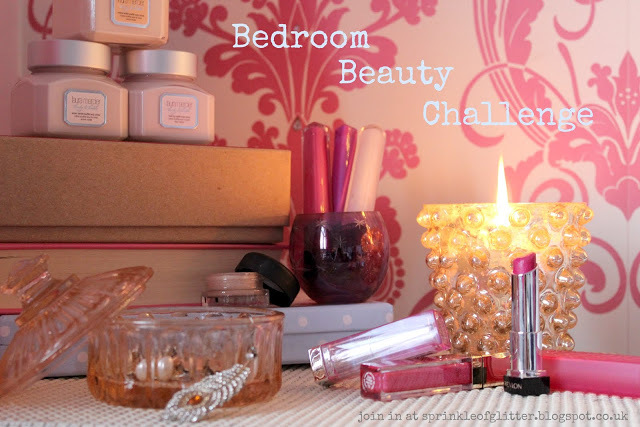 Beauty By Lizy: Beauty Challenge #1 + Instagram! Beauty Challenge #1 + Instagram! I'm a little late to the party here, but I've finally got an iPhone (5 woop woop!) and joined Instagram. If you have Instagram too, then feel free to follow me. I'd love it! My Instagram name is BeautybyLizy. I've been taking loads of pictures and sharing things with you that you might not otherwise get to see on my blog, so definitely take a look. The picture above was taken on my iPhone and is the look I created for Louise Sprinkle Of Glitter's Bedroom Beauty Challenge. It's to get everyone being a little more creative and pushing the boundaries of what makeup looks they can create and wear. This months look is called Vivacious Vixen and I drew my inspiration from how I thought a Bond Girl would wear their makeup out on the town. Being all Vixen-like and what not. I did have bronzer and blush on as well but the Insta filter I used washed it out! PS totally got my eyebrows done the day after! You can click the picture below to go to Louise's blog and find more pretty girls who have done the challenge too. Thanks Louise for getting me out of my comfort zone this week. I've worn amazing eye shadow looks to work all week and all the ladies think I have a secret second boyfriend or something! I can't wait for next months challenge! Let's hope it's not 80's inspired! Just to remind you all about my Beauty by Lizy Facebook Page too! Thanks so much for your lovely comment :) I love this make-up look so much. You have such a nice blog! nike air jordan 11 retro low gs aqua Après une comparaison Asics Gel Kinsei 6 Femme détaillée dans les armes de tranchée alors en usage, les États-Unis et la France asics gel nimbus femme test ont commencé à produire dans le Mark I Trench Knife, en 1918, air jordan 5 oreo pas cher au cours des derniers mois de la guerre. En 1990, un asics gel lyte 5 atomic blue mentor différent, Phil Jackson a été mis à la charge air jordan pas cher boutique avis des Chicago Bulls. Musée d? Orsay est l'un des musées basket nike tn requin femme les plus réputés de l'environnement, réputé pour abriter l'art français et une chaussure nike sb homme large collection de peintures impressionnistes et postimpressionnistes, de photographies, de sculptures et asics gel nimbus test autres.